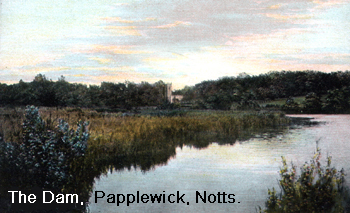 Construction of several mills along the River Leen, on the eastern side of Hucknall Parish, began in the late 1700s. These were built by the Robinsons, who used the river as a power source for spinning cotton, but as a result of irregular water flow, they contracted with Boulton and Watt of Birmingham to supply steam engines. 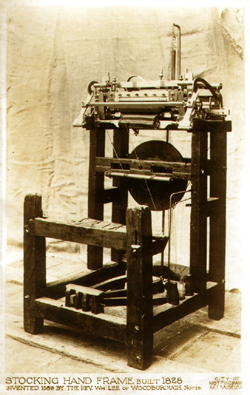 These became the first steam engines to be used in the textile trade. The local industrial area of that time was around Linby and Papplewick, as Hucknall was just a middle-sized village with work mostly being confined to hosiery and agriculture. 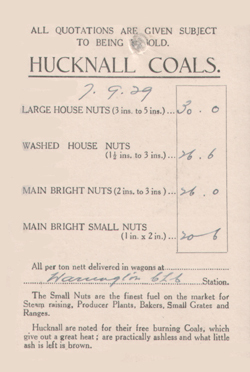 Documentary evidence shows framework knitters have been located in Hucknall since the 1600s. For this cottage-based industry, frames were located close to windows, enabling light to penetrate for knitters to do fine work on the machines. In 1844, there were over 800 frames in Hucknall. Gradually, the home work gave way to small hosiery factory workshops, some of which became famous for making very fine Shetland shawls and falls. So fine was this unique work, that a shawl, measuring 2 yards square and containing 1,000,000 to 1,300,000 loops and weighing less that 2� ounces, could be pulled through a finger ring. They became justly famous the world over. The first railway station opened on the Midland Line, between Nottingham and Mansfield, in 1846. Then, in 1861, several men met on Watnall Road and turned over a few grass turves to mark the beginning of coal mining in the Leen Valley. This was to change Hucknall completely and bring it into the Industrial Age. As inducements to encourage the necessary skilled colliers to move into the area, houses were hurriedly built by the colliery company. 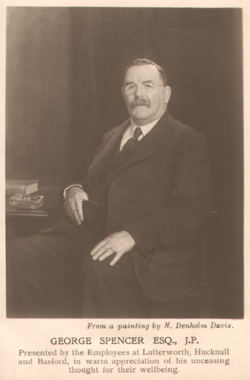 The town grew rapidly from then onwards and other individual entrepreneurs built houses and businesses as families came from Warwickshire, Staffordshire, Leicestershire and Derbyshire, for work in the collieries. Pits dominated the work scene for most of the male workers for well over 100 years, until the closure of Hucknall No. 2 Colliery (Bottom Pit) in 1986. Work was available for the men and boys but where were the jobs for women and girls? One of the few opportunities was work in Dexters� Cigar Factory, making the celebrated 'Key West' cigars until the Duke of Portland was persuaded to sell parcels of land for industrial development. An early partnership to take advantage of buying this land was the Taylor Brothers who built a factory making underwear on King Edward Street. George Spencer also benefitted from the Duke�s wish �to encourage factories where a large amount of female labour will be employed�. These new buildings were super factories when compared with the floor area and number of employees in the older shawl workshops. So factories making famous global brand names like Vedonis, Viyella, Jaeger and Montfort were located in Hucknall, employing hundreds of people, but these are gone now leaving just a few firms to carry the textile banner onwards. Rolls Royce came to the aerodrome in December 1934, later extending into a testing establishment for aero engines. The V.T.O. (vertical take off) engines were developed in the 1950s and the prototype for the Harrier jump jet, locally known as �The Flying Bedstead�, was born here. © 2005 - All rights reserved.